KINSHASA, 28 Jul 2006 (IRIN) - Columns of smoke rose over Kinshasa on Thursday as political violence claimed the lives of three policemen and at least three civilians ahead of Sunday's elections in the Democratic Republic of Congo (DRC). The headquarters of the Independent Media Authority, set up to ensure fair media coverage, was set on fire, as was the compound housing the bodyguards of Vice-President Jean-Pierre Bemba, a candidate for the presidency. The charred bodies of two babies lay in front of the compound as women howled with grief. "This means war," said one man who was too angry to give his name. International observers of the elections and United Nations staff were told to stay off the streets, although by the evening the warning had been lifted. Three policemen died in the violence, the governor of Kinshasa, Kibembe Mazunga, said on state television on Friday. Neither government authorities nor the UN had given an official toll of the death and destruction by Friday afternoon. "This was not a good day though it could have been worse. It can be expected in the context of the political jousting," Kemal Saiki, the spokesman for the UN Mission in DRC (MONUC), told IRIN on Thursday. "We are still hopeful that it will not deteriorate further." Supporters of President Joseph Kabila reportedly attacked those of Bemba, who rallied at Kinshasa's Tata Raphael Stadium and filled it beyond its 50,000 capacity. Police clashed with the supporters, using tear gas and shooting in the air. After they failed to disperse, witnesses said, police shot into the crowd killing at least one person. 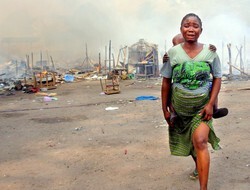 Crowds attacked and burned down buildings owned by public figures linked to Kabila. One was a church led by the evangelist priest, the Rev Sony Kafuta. Another was a concert hall owned by star musician Noel Ngiama Makanda known as Werrason, a strong Kabila supporter. At a news conference on Friday, Ross Mountain, the Deputy Special Representative for the UN Secretary-General in charge of Humanitarian Affairs in Kinshasa, presented his condolences to the families of the people who died in the violence. At the same time he said most of us "are still here the next day, and Kinshasa is again quiet". He expressed confidence in the police. "We believe events like yesterday's show that the police and national authorities can control such situations," he said. The UN has some 17,000 troops in the country, the largest UN force in the world. A special unit of 2,000 troops from the European Union supports it.